Puyo POP FEVER has a setup process that is quick, simple, and easy to understand. Even the smallest details were addressed in this game. While the game uses color-based puyos, they even gave each color a different set of eyes to help people that are color blind. The menus are laden with mini games and little secrets. If the game sits idle, it'll give you graphical "classroom instruction" about some of the game's features. The menus in the game are very simple. The fields to tap on are large and not placed too close together, so you won't accidentally tap the wrong one (you can, of course, use the direction pad and "A" button as well). No matter which menu option is selected, there's a basic description of the option for you right on the upper screen. The gameplay for Puyo POP FEVER is simple and reminiscent (but not a copy of, by any means) classic Tetris, but only in the basic elements. Pieces fall, you can spin them, and they drop. Unlike tetris, color counts, puyos break apart after falling, no space is covered up, lines across the screen aren't needed, and then there's Fever mode. While the board uses only a small portion of one of the screens, a bigger board isn't needed and it allows you to see what everyone else is doing to you (or is about to do to you). Fever mode can get a little distracting if you have a nearly full screen when it kicks in and you were looking ahead to where you were going to put the next piece, then come back to find a different piece waiting for you. I'm going to break this one down into three categories: the game's look, the sound, and the features. The game's look is very, very, very sugary (the game can NOT give you diabetes, so leave that joke alone, please) with mostly softer colors and designs. It makes the game look all sweet, which it isn't if you make give it the right abilities. The game's sound is fine - not terrible and not the most annoying thing on the planet. The taunts are fun, but they can get old quickly. The sound is about as sugary as the look. A couple of the sound effects help cue you in to what's happening/about to happen, but they're not essential. As for the last category - features - I'm just going to say one thing: 1,173,950,786,776,003 different combinations of rules and options!!! And yes, I actually calculated that out (on a computer's calculator). More than one point one seven quadrillion combinations! Puzzle games, when they're done well can be addictive. This one can be very addictive, because it was made very well. You can pick it up and play quicker than classic Tetris but it takes more to master than classic Tetris. People with short attention spans for mastering games (short-sighted) many put it down, as might people who get put off by it's over-the-top sugary atmosphere. Intelligent people that love puzzle games, on the other hand, know that a puzzle game is judged on its merits, and not on its looks. They'll love the game, as will anyone in general that loves a challenge and/or a game that stimulates forward-thought. A SuperBoard single player option that uses the entirety of both screens for a giant Endless Puyo POP. Skins with different themes to attract short-sighted audiences that'd dismiss a great game based on its look. 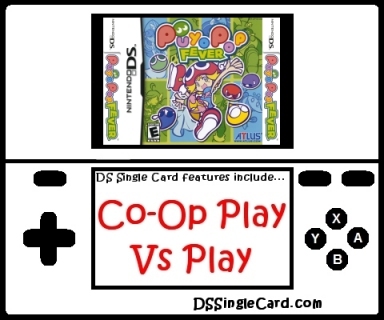 Click here to return to the DSSingleCard.com Puyo POP FEVER profile.